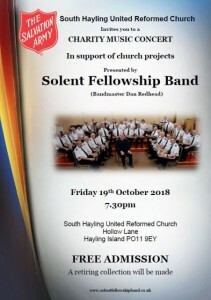 The Band will be giving a charity concert to aid funds for The United Reformed Church at South Hayling, Hollow Lane, PO11 9EY. The concert starts at 7.30pm on Friday 19th October 2018. It is free admission but there will be a retiring collection to support the churches work in the community of Hayling Island. 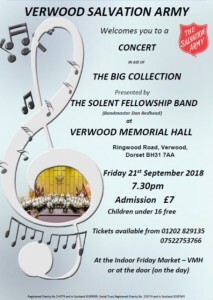 Tickets available from 01202 829135 or 07522753766 or at The Indoor Friday Market at Verwood Memorial Hall, or At the door on the night.